Yes "Z" is for zombies - and lots of them. It appears that Hollywood's fascination for Vampires is at an end and zombies are the new "in" thing. 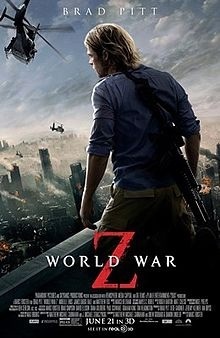 Based on the 2006 book of the same name by Max Brooks, World War Z is action from start to finish, with a few jump out of your skin moments just to give you that extra bit of adrenaline rush. We saw the movie in 3D, which was fun but I don't know that you'd miss it if it wasn't there. While remaining true to your typical "zombie" lurching walk, these characters didn't do much more than groan and gnash their teeth. The real zombie effect came in the masses of zombies rampaging through the major cities of the world as a viral disease makes its rapid progression through the human race. CGI experts have had a great time creating crowds of zombies to terrorize the streets and scale massive walls. This movie is a comment on all of the major disease attacks of modern times and the human response to it, basically Spanish flu in a very visible and un-dead form. Brad Pitt plays a very believable ex-United Nations employee turned house husband, who, when the crisis hits America, is called upon to save the day. The sub-plot is his conflict at once again having to leave his family, albeit to save the world. Fortunately his character isn't your expected infallible romantic hero. Rather he just seems to be an ordinary guy who is able to put two and two together to come up with a plausible solution to a world problem. There are some intelligent comments on Nature's role as a serial killer and it's nice to have an ending which is not quite the Hollywood "cream tea and roses" that you would expect from a "hero saves the day" movie. World War Z is an action packed, adrenaline pumping film with a few good scares and some cool effects thrown in for good measure. See the trailer and download a game on their cool interactive Website. Go and see it if you have a few hours to fill in, if you are a zombie movie fan, Brad Pitt fan - but don't take your girlfriend to see it on a romantic date. Why? Go and see it if want need to get the adrenaline pumping.